Host a Workshop or Gathering at your place. You provide the space and you receive 1 free registration with 7 or more paid registrations. Contact Zelda by phone 518-732-7440, or e-mail for more information. Be sure to visit our Events Page to check out all upcoming workshops! Cost: $650.00 all materials included. $100.00 deposit non refundable. See the Events Page to sign up for next workshop. The mask making is about looking at your duality. To look at the teaching and the patterns that come from that side of your self. One of the most transformative and creative acts you can undertake, is to create a mask of your face. On Friday I make the space into the energy of a sweat lodge (w/o heat) where we come into prayer as the cast mask gets formed to our face, we then take it off and then we pour plaster into the form of the mask and seals the energy of the form. 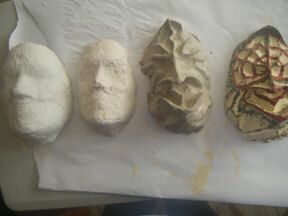 On Saturday we take clay and we build it onto the form of the mask, of the image that comes through us. After that we do some stretches, yoga and breath work. In the afternoon we then paper maché the clay part of the mask. On Sunday we paint and decorate the paper maché mask. So you walk away with the cast mask, plaster mask, paper maché. It is a beautiful transformational time to spent with ones self. Contact Zelda at 518-732-7440 or email pinetree444@msn.com for more information or to schedule a workshop. In this workshop, you will have the opportunity to create and learn how to use a rattle. We will journey to find your Animal Totem and its fur or feathers for your rattle. 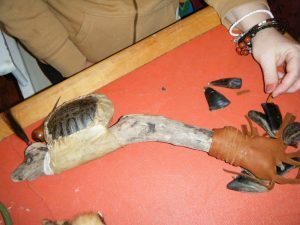 You may choose from a wide variety of materials, including fur, bones, colored leather, hooves, dew claws, bells, hickory nuts, tin cones, and turtle shells (extra charges for rare materials, i.e. snake skin, etc.). Once you have chosen the materials for your rattle, we will journey to discover the vision of how the rattle wants to be made. 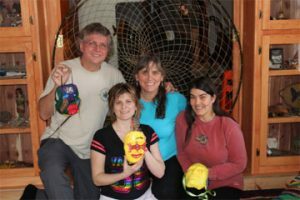 When all the rattles are completed, I will share with you how to use the rattle for your personal healing. Please call 518-732-7440 or email pinetree444@msn.com for available dates, fees, and more information. In this workshop, you will create a 16” drum and Drum Stick from start to finish. You may choose from buffalo, elk, or deer skin. You paint your rim, then choose the skin for your drum head. You will learn to intuitively select the section of the skin to cut for it. Includes 16″ drum, drum stick, drum bag, and the process of your healing through the journey in birthing your Drum. Zelda will assist you in creating a drum in a unique way involving the healing of your inner child to release old beliefs which no longer serve you. This process will transform you and allow you to move forward on your spiritual journey. Let your kid come out and play! Release old patterns and beliefs in a safe and nurturing way so you can move forward in your life. This experience will differ for each individual, depending upon what your needs are. It is important not to have preconceived notions, to be open like a child to your intuition and what Spirit has in store for you. Let it be a Surprise Gift! This workshop recreates the safety of the womb. It allows you to rise up with your (Mother Earth) to recognize old beliefs you brought with you into this world, and how they no longer serve you. Discover how to bring in new beliefs that will support your inner transformation, and help you to reconstruct a new way of looking at life. Or, you can simply make a drum. Time: 9:30am – 5:00pm each day! Please call 518-732-7440 or email pinetree444@msn.com for available dates and more information. 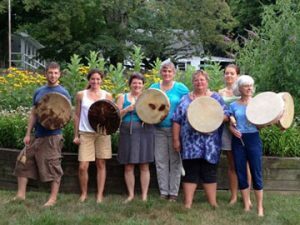 In this workshop, I share how I work with my Drums and Rattles with vibration of each one of the sounds. We will detect where energy is stuck and how to move the energy. Also how each one of the sounds from different rattles link together and do a full energy sweep throughout the body. Create a personal shield that reflects your life journey and spiritual path, to honor where you are now and where you are going. We will begin with a meditation to find the animal and plant medicine needed to complete your shield. You may paint images of power symbols, animals, etc. on your shield. We will use a variety of materials including leather, beads, fur, nuts, feathers, bones, bells, and more to personalize this power piece. The finished shield will be 18” in diameter. 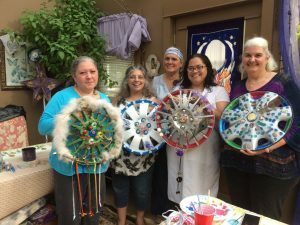 Making an ancestor doll is a co-creative process with Mother Earth, and what the spirit of the earth is offering through all her fibers and gifts. Your finished ancestor doll represents who you are, where you stand, and the strengths and gifts you have to offer. Discover your voice and purpose through the creation of Spirit in form. We will use a variety of natural materials including leather, fur, bones, beads, bells, feathers, plants, stones, seeds, and nuts. ** Zelda’s Travel, Accommodations and Meals not included in pricing when location is outside commuting distance of Castleton, NY. Please note: No animals have been killed for the direct purpose of creating drums, rattles, bags, or other sacred objects.These are all made from recycled fibers of the earth such as hickory nut shells, wood pounder handles from previously fallen trees; and hides, shells, dew hoofs, or other sacred materials have been obtained from either hunters, or suppliers who recycle products from animals used for food. Most furs are "second-hand" products that I recycle from previously made garments that would otherwise be discarded or destroyed.